It was So Much Fun We had to do it Again!!! 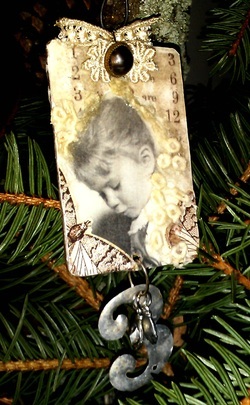 Family Memory Makers Ornament ( Pictured) w/Robin- Create a memento of family, pets, places you visited an event or person important to you. $20 for 3 ornaments. -photo copies of your old family photos or images. Images should be 1" x 2-1/2 inches but up to 3 inches. -Black and White copies work best. -Bring various sizes to be safe. -Any embellishments that remind you of the person in your photos. We provide the base of the ornament, the techniques and all the rest of materials you will need to create your own special gift for your holiday giving. ( Coming Soon) to showcase “A Month of Authors”. Pay attention to symbols and clues in the window and be the first to solve the “Mystery at the Arcade”. Your Happiness is in Your Own Hands "
You can make your very own bluebird of happiness! He will make your life less stressful for days to come! Carole Monahan of Compelled Crafts will show you how……Join her for a fun filled afternoon of laughter and empowerment. Sign up for her class and make your own Wort the Worry- bird AKA- THE blue bird of happiness! Cost for the class is :$20.00 and that includes all materials and tools needed. Please email Carole or Robin By June 14th to let us know if you can make it so I can get your clay ready.